Vacation families can take a break from Everglades adventure by grabbing some shade in Fort Critter. Here, our guests can experience a unique animal show in a small, intimate setting, located right in the middle of Billie Swamp Safari park. Furthermore, visitors will be up-close and personal with some of the most interesting and exciting wildlife. In other words, everyone will feel like they have a front-row seat. Generally, critter show participants will range from reptiles to mammals, including a baby alligator. Photo opportunities available after each show. This wildlife performance is great for small kids, who can touch and feel with the assistance of our trained handlers. Moreover, this Everglades attraction is perfect for everyone; individuals, families and groups. But, Don't forget to jump aboard our Everglades airboat ride or swamp buggy tour so you can see them in the wild. An Everglades Attraction Filled with Animals Running Wild! When the show is ready to start, all critter show guests are asked to come in and promptly be seated so the doors can be locked. We do this for animal, handler and guest safety. Remember, this is an interactive critter show and the creatures get to run around and show off a little. Once all the exits are secure, the show begins and the excitement and discovery of some of the Everglades best critters begins. Our critter show offers both Everglades native (as well as non-native) creatures in this uncaged performance. Additionally, our critter show is big hit with moms and dads, who love the educational experience it provides for kids in this fun, safe setting. 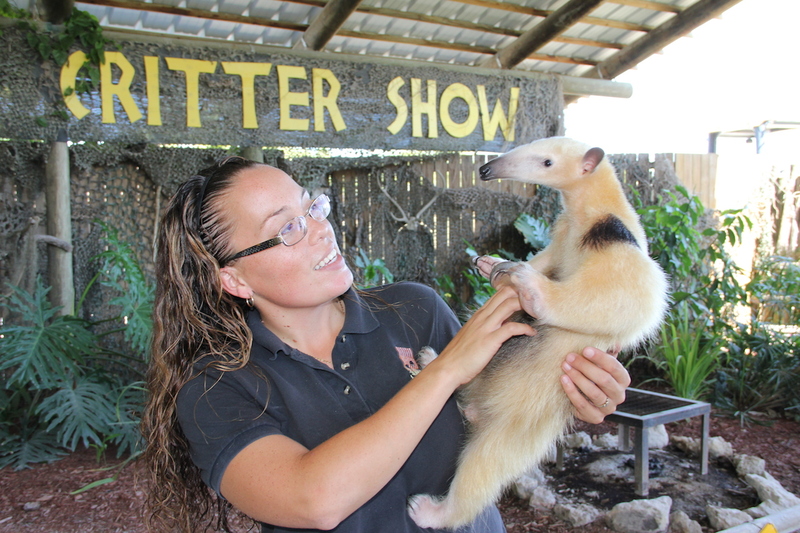 Just as exciting as our airboat rides, our interactive critter show is a terrific family attraction. As such, our handlers will teach you fascinating information about the creatures, then give you the chance to mingle with the animals. Lastly, the show is safe for children of all ages but, we require that younger children are escorted by an adult.